Hauskaa lauantaita, tervetuloa viikon Allsorts haasteen pariin! Tällä viikolla pääosassa on "teksti". Hi; Happy Saturday, it's time for a new Allsorts Challenge! Our theme this week is "All Sentimental". Please head over to Allsorts Challenge for all the details and prizes of this challenge, and to check out all the fabulous inspiration from my very talented team mates. Follow me with- Seuraa blogiani Bloglovinin avulla. 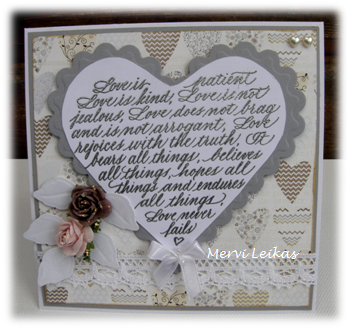 That is a beautiful focal quote Mervi and a lovely card perfect for so many occasions. Fabulous card, love the papers and the way you have fitted the text into the heart shape, very clever. Very elegance creation! I love the embossed sentiment and the added touch with the pearls. A truly wonderful layout. 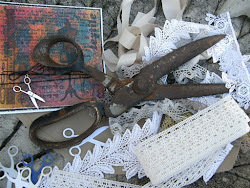 Thank you so much for sharing it with us at 4 Crafty Chicks for our Pearls Challenge.